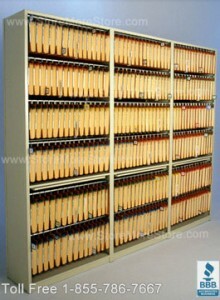 Lateral file cabinets are typically the default storage system most companies use. They’re sold everywhere you turn; they’re usually pretty affordable; and they’re a staple of office storage. But before you invest in more lateral file cabinets for your office, here are 3 questions you should ask yourself. 1. Will More File Storage Really Meet Our Needs? Offices store so much more than just files. Supplies, boxes, binders, literature, forms, food, computer parts, and product samples are just a few of the things you might be storing in your office. The problem is that none of those things were meant to be kept in file cabinets. So before you make the purchase, think about all the things you need to store, and if file cabinets are really the right choice. One alternative that works just as well as lateral file cabinets for storing files but can also store other items you have in your office is rotary file cabinets. The rotary file cabinets have all kinds of accessories that make storing a variety of items possible, and they lock up tight to maintain secure access. 2. Do We Have the Space for More Lateral File Cabinets? One cabinet here; one cabinet there…you might not think they take up a lot of space, but that’s just not true. If you were to group all your lateral file cabinets together, you could see that the amount of floor space they hog is astronomical. And with leasing and building costs continually on the rise, lateral cabinets might be costing you way more money than they are worth. On the other hand, sliding mobile shelves will greatly reduce the amount of space you need to dedicate to storage. By extending your storage vertically and stacking rows of shelves in front of each other, you maximize every inch of available space. And you have better access to all your stored files. 3. Are the Lateral File Cabinets Going to Help Productivity? Employee productivity is a big deal. If your employees have trouble doing their jobs, then they are more likely to be unhappy. And unhappy workers equals unproductive workers. So if your employees are opening and closing drawers all day to find the files they need, that’s a problem – a problem that more lateral file cabinets won’t solve. Instead, you might try open file shelving. With open file shelving, employees can see every file without having to open a drawer and stand awkwardly to read the labels. Also, if you are worried about securing your files, you can easily add rolling doors to almost any type of open shelving. Just because lateral file cabinets have been the default storage system in offices for years, doesn’t mean you need more of them. Asking these questions will help determine if more lateral cabinets are the right choice. More than likely though, there is another solution that will better meet your needs. 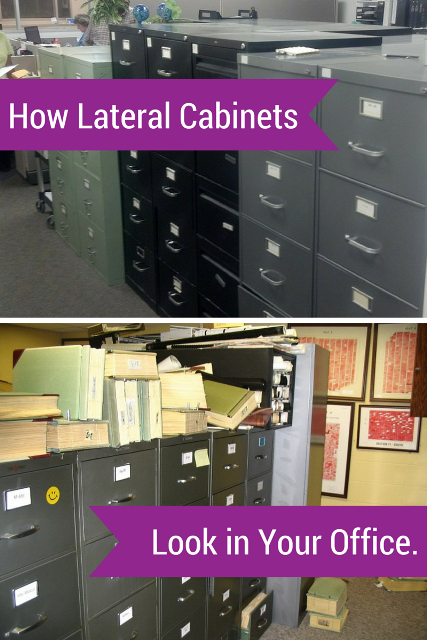 Not only do lateral file cabinets take up a substantial amount of your office’s floor space, they also make documents hard to find because everything is hidden inside a drawer. If you are looking for office furniture that will enhance your efficiency, consider Open File Shelving from StoreMoreStore. Open File Shelving will save floor space and provide a professional appearance for your office. In addition, we also have Shelf Organizers and Dividers for every type of Open File Shelving that will keep your documents, files, literature, folders, or paperwork arranged in the shelves for easy retrieval. 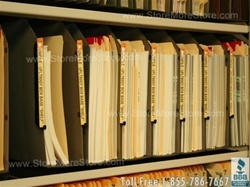 Organize your stored documents in your Open File Shelving with a Shelf Organizer sold exclusively at StoreMoreStore. The Shelf Organizer unit sits perfectly in your Open File Shelving. It comes with Oblique side tab hanging folders with easy to read 6” magnified label holders. The Oblique Folders hang on rails and expand and contract to maximize the available shelf space while keeping your information organized. 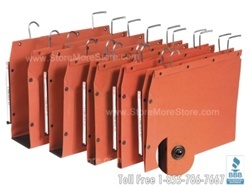 The Shelf Organizers are available in standard widths are 33-3/4″, 39-3/4″, and 45-3/4″ with custom sizes available. Adding Dividers to your Open File Shelving is one of the best ways to keep your documents grouped and standing upright within their appropriate categories. In addition, Dividers keep your files packed just snuggly enough for easy access. If they’re packed too close, it’s hard to get a folder out without accidentally pulling out more than one file. 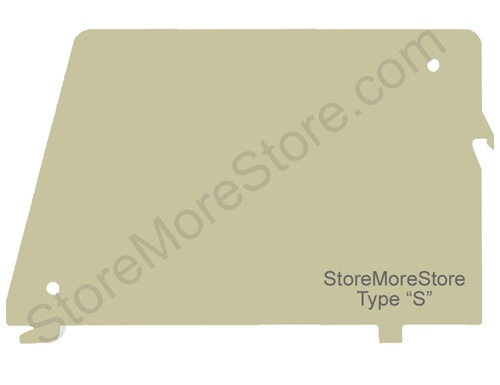 We have Dividers for every type of Open File Shelving. Shop online now at StoreMoreStore for new office furniture including Open File Shelving, Shelf Organizers, and Dividers! If you have any questions give us a call at our toll free number 1-855-786-7667 or send us a message.